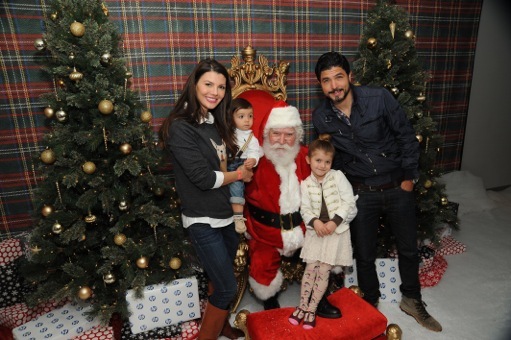 On Saturday, December 1st, 2012 celebrities and their families attended the 2nd Annual Santa’s Secret Workshop Presented by Bill Horn and Scout Masterson at the Andaz Hotel in West Hollywood, CA. In the giving spirit of the holidays, the event benefited L.A. Family Housing, whose mission is to help families transition out of homelessness and poverty through a continuum of housing enriched with supportive services. 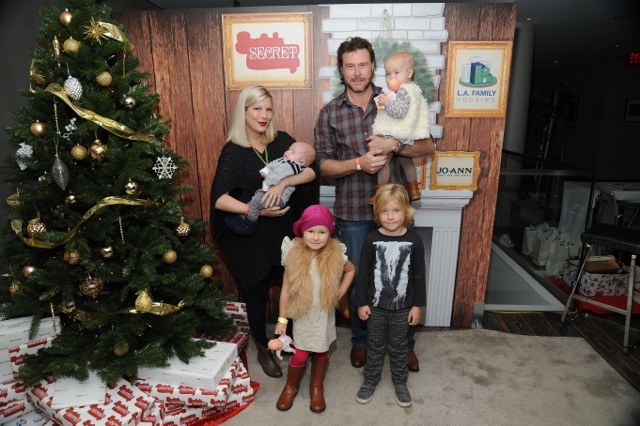 Tori Spelling and Dean McDermott made their first public appearance with all 4 of their children, including newborn Finn. Sarah Michelle Gellar arrived with her daughter Charlotte for a little mommy-and-daughter time. ‘The Bachelor’ couple Jason and Molly Mesnick, who expect their first child next year, stopped by the event before heading to another “Bachelor” wedding (Ashley and JP). Families were able to pose in the HP ultimate photo studio where a professional photographer captured their moment with Santa Claus. LA’s Club Mom.me hosted a “ME Lounge” for parents that featured relaxing manicures and a personalized, create-your-own scent bar. While in the adjoining “Little ME Lounge” guests’ children enjoyed kids’ nail bar, glitter tattoos, play time activities, and cookie decorating with dessert-ista, Jenny Cookies. Event décor was courtesy of Jo-Ann Fabric and Crafts, and was styled by Sybarite Designs. Some of the great brands on hand showcasing their latest products included SodaStream, Corolle, Stokke, Orbit Baby, Ergo Baby, Teddy Needs a Bath, Funktion, Numi Numi Design, Ju-Ju-Be, Innobaby, and Joovy. Some of those who attended include Malin Akerman, Tiffani Thiessen, , Tori Spelling & Dean McDermott, Angela Bassett, Jason & Molly Mesnick, Gilles Marini, Sasha Alexander, Angela Bassett, Ian Ziering, Lisa Rinna, Lindsay Sloane, and Ali Landry, among others.